No 26D i Kandy, Sri Lanka: Reservér nu! 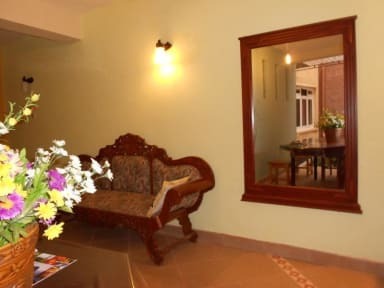 Built in 2011,No 26D Home stay is with an ideal location on a quiet lane just 20 meters from Kandy Lake. It is next door to the famous Hotel Suisse, and easy walking distance to the Kandy City Center and the Temple of the Sacred Tooth Relic. There is a roof top terrace with many flowering plants. It is sunny in the morning, and shaded in the afternoon. The terrace of the 26D Home stay has a panoramic view of Kandy Lake and the hills of Udawattekelle Sanctuary which is great for cool walks. This forest preserve has huge trees, good bird-watching, and lots of cheeky monkeys. The four guest rooms are grouped around two interior courtyards. The spacious rooms are light, airy, and well-decorated. 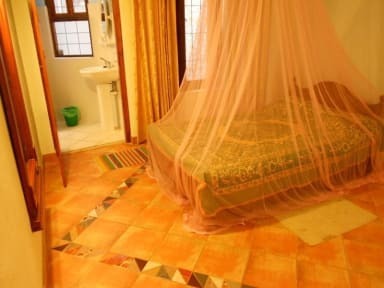 Each room has a ceiling fan (AC isn`t necessary) and a mosquito net. The terrace level rooms have cathedral ceilings with skylights, and windows on two sides. One room has a double and a single bed. The two rooms on the lower level are both en suite, and share a large living/dining area with tables, chairs, and a couch. Perfect for families! New mattresses and pillows in all rooms ensure total comfort. Good strong lights make reading in bed a joy. If you run out of books, a guest library is available.